Celebrating 11 Years - Write for Wine: It's Wine O'Clock Somewhere!Write for Wine: It's Wine O'Clock Somewhere! This month we are celebrating the 11th anniversary of Write for Wine, It’s Wine O’Clock Somewhere! Eleven years – wow! When the blog launched in June 2007, we wrote about Washington wines, wineries, events, wine clubs and wine bars from Woodinville to Walla Walla. Soon after, we began our presence on Twitter — we now have 11,500 followers. Facebook followed shortly after, and more recently, Instagram. What a ride it’s been! These days, we continue to write about wine from Washington state, but we also feature wines from California, Oregon, B.C., France, Australia, New Zealand, Italy, Spain, Chile, Argentina and more. We have tasted some fine wine, met some terrific people, and travelled to many wine countries during the past 11 years. If you do a search on the blog, or scroll through the calendar archives, you will likely find a special gem or story that speaks to you. At least, we hope so! 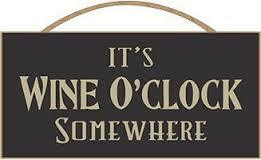 Our motto is “It’s wine o’clock somewhere!” In fact, this blog can also be viewed at wineoclock.us. The phrase “it’s wine o’clock” initially came in 2003 from Peter, our friend in London who worked with me. Every Friday, at 5:30 p.m. in London, Peter would call to tell me “it’s wine o’clock.” Here in Washington state, it was the beginning of the day. As a result, we added “somewhere” to Peter’s phrase and adopted it as our own 15 years ago. You will now see it in posts here, on Facebook, Twitter and Instagram. And the phrase “It’s wine o’clock somewhere” never fails to inspire creative responses from other wine enthusiasts. So thank you, to our family, friends and followers for an amazing 11 years! Cheers – it’s wine o’clock somewhere! This entry was posted in Wine and tagged It's Wine O'clock Somewhere, wine blog, Write for Wine by Margot. Bookmark the permalink.